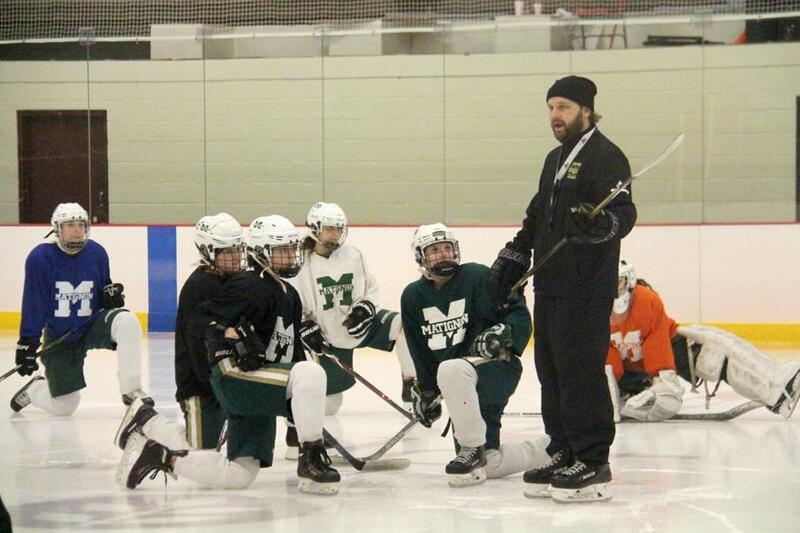 Anthony Cornacchia is in his first season as head coach of the Matignon girls’ hockey team. Ninth in a series in which the Globe profiles a varsity high school team from Eastern Massachusetts. Attention to detail is key for the Matignon girls’ hockey team. The focus on execution was apparent as the Warriors carved up the ice in a Friday afternoon practice at Emmons Horrigan O’Neil Memorial Rink in Charlestown. Whistles blew after every rep of a drill, with coach Anthony Cornacchia and assistant Mark Wall offering pointers. If a player messed up, she completed the rep until she did it properly. The 30-year-old Cornacchia has leaned on Wall, who coached the team through last season before stepping down to an assistant role. Entering Saturday’s game against St. Joseph’s Prep/Mount Alvernia, the Warriors stood at 9-5-2, scoring 3.25 goals per game while allowing just 1.31. The senior captains — defenseman Emma Brennan (Winchester) and forward Caitlyn Mahoney (Melrose) — have led the way. Four of the Warriors’ five losses have come against teams ranked in the Globe’s top five, and Matignon tied fifth-ranked St. Mary’s, 1-1, last Saturday. The Warriors laid the foundation for their success before the season officially started. In early December, the Matignon girls spent a weekend in Waterville Valley. The trip included rigorous conditioning practices at Waterville Valley Ice Arena, as well as a scrimmage against Hanover (N.H.) High. The Matignon roster lists 11 hometowns, from Arlington, Brighton, Charlestown, and Dorchester, to Melrose, Medford, Peabody, Revere, Stoneham, Peabody, Wakefield, and Winchester. An opportunity to bunk with teammates in a hotel room went a long way. “It set the tone for the rest of the season,” Mahoney said. Ask anyone on the team, senior goalie Dana Smullen (Peabody) is rock solid. “She’s stood on her head the entire season,” Mahoney said. Smullen totes a .942 save percentage to go with nine shutouts. Opponents have scored just twice in the Warriors’ past six games. At 5 feet 2 inches, Brennan owns the blue line for the Warriors. In addition to providing a wall of defense in front of Smullen, Brennan has registered a team-high 14 assists. She’ll be continuing her hockey career at Salem State next year. Those are the two words Cornacchia stresses in practice. The Warriors emphasize stick skills and situational hockey in their practice sessions. On Friday, they spent 20 minutes working on 50-50 pucks against the boards. “Skill development, especially in season, isn’t something we work on enough as a hockey community,” Cornacchia said. Brennan says the sessions have helped her develop her offensive skills from the blue line. The Warriors coach played one year at Leominster High before moving on to St. Bernard’s in Fitchburg, where he was a Catholic Central League All-Star. Plans to play at Fitchburg State were derailed by injuries. When Cornacchia enrolled at New England Law School, hockey took a back seat. Then, in October 2014, Cornacchia saw an advertisement for an assistant position on Wall’s staff at Matignon. He sent an exploratory e-mail. Wall stepped down to a volunteer assistant role at the end of last season, when his daughters, Ciara and Kaleigh , began playing at Worcester Academy. Cornacchia was ready to go. “I can’t tell you how much things have fallen into place,” Cornacchia said. Matt MacCormack can be reached at matthew.maccormack@globe.com.